Vienna is currently seeing the construction of “The Ensemble” – a new residential district on the 31,000m2 site of the former post bus center in Vienna. The construction company HABAU and its subsidiary ÖSTU- STETTIN used nine WOLFF clear cranes to build ten individually planned residential buildings, a supermarket and an underground car park for 500 vehicles. Construction is planned to be completed by 2020. The flat-top slewing cranes of types WOLFF 6023, 6031 and 7032 belong to the WOLFF clear-series and feature a compact design, facilitating quick assembling and dismantling times. “The greatest challenge was actually the planning phase”, explains Dieter Reuberger, Managing Director of WOLFFKRAN Austria GmbH, “because on the one hand, we had to focus on positioning the cranes in such a way that they can optimally service all areas of the job site, while on the other hand we kept hook heights as low as possible in order to keep costs down.” The red WOLFFs on the Vienna Danube Canal were set up with hook heights from 46.5 to 68.8 meters and jib lengths between 40 and 55 meters. 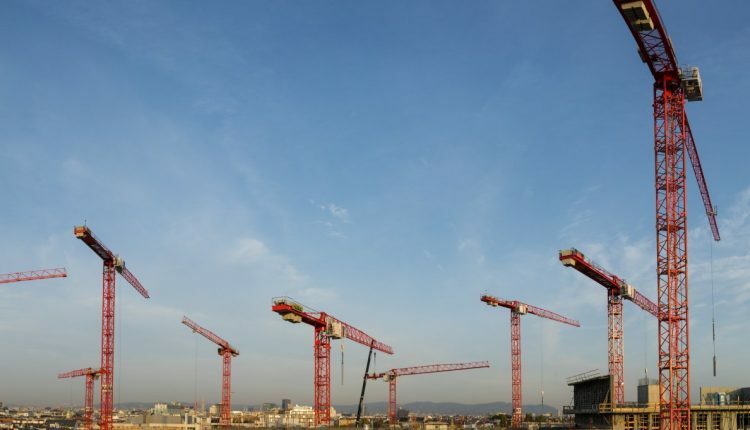 With so many cranes slewing over one another, particular precision and expertise on the part of the crane drivers were required to ensure safe lifting operations on this job site. Irrespective of whether the cranes were used for handling construction material or for concreting work, the all-rounders from WOLFFKRAN with maximum load capacities of up to 12 tons reliably completed every construction phase in this rapidly changing residential district. All nine cranes were placed on the two-part WOLFF foundation anchors, enabling ÖSTU-STETTIN to use its own WOLFF re-usable anchor spigots. While assembling the cranes was a routine job on a still empty job site, dismantling had to take place amidst the newly built district and without interrupting the ongoing construction process – from the truck access to loading the crane components. Dismantling took place in different stages using several mobile cranes with up to 350 tons capacity, which were positioned either between the new buildings or in the access area to the job site.